Sweet potatoes are the vegetable of choice for many looking to change their diet to include more healthy choices. The good news is that this healthy choice is also one of the tastiest you can make. Sweet potatoes are truly delicious, my favorite to ways to enjoy them are grilled and as fries. 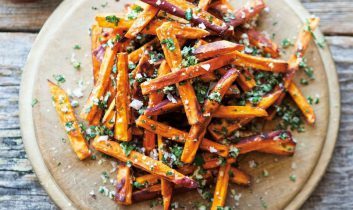 This is my recipe for sweet potato fries (actually baked) and one I could enjoy everyday! Bake until brown and crisp on the bottom, about 15 minutes, then flip and cook until the other side is crisp, about 10 minutes. With about 5 minutes left on cooking time, sprinkle with garlic and place back in oven. Serve hot and sprinkle with fresh parsley.